A garden is one of the most beautiful gifts you can give your child. It’s a place of escape, where you can gaze upon the wonders of nature, and a method for demonstrating the positive benefits of hard work, patience, and tender loving care. It’s never too early to expose your little ones to the joy of gardening, although there are certain obvious limitations. Prior to kindergarten, the wait can seem agonizing. The littlest ones are often appeased with rudimentary tools and the opportunity to get their hands dirty. Keep a watering, weeding, fertilizing, and projected growth date calendar for three and four-year-olds to maintain your child’s interest throughout the season. Peas and beans sprout from seed within a week, making them the best beginner plants. Beans are so easy to grow, you can grab a few dried pinto, black, or kidney beans right from your cupboard, place them on a wet paper towel inside a plastic bag on a sunny windowsill, and watch them start to sprout before your very eyes. If you’d rather get your hands dirty outside, a bush bean variety like the “Purple Queen” is easy for kids to spot and pick. We also love this whimsical Bean and Morning Glory Teepee, which provides a fun outdoor playhouse for your child all summer long. Herbs like Mint or Basil are particularly hardy. They grow fast and furious in as little as four days, and can withstand a bit of stomping. Some toddlers will even pick and eat the fresh leaves. Chives and Cilantro take about 10 days to get going, but cilantro will require more careful care, as it has a tendency to bolt if it’s not cut back in time. Dill, Oregano, and Thyme can take two weeks to grow. Sage and Parsley are considerably slower with four weeks before germination. You can grow herbs in a pot, a windowsill box, or the ground. Any kid who has ever read “Jack and the Beanstalk” will be astounded by a sunflower’s impressive growth. Dwarf varieties grow two or three feet tall, but Mammoth Russians, American Giants, and Giganteus sunflowers can reach 12 to 15 feet. The seeds begin to sprout in just seven to 10 days, with big bright flowers appearing in two months, and the first seeds developing three to four months later. To enjoy continuous blooms all the way until the first frost, sow a new row of seeds every two to three weeks. Radishes may not be your child’s favorite vegetable to eat, but they sure grow swiftly. The “Easter Egg” variety produces mature red, purple, and white vegetables in one month. The French enjoy radishes with butter and salt, the Koreans pickle them, Mexicans throw them into tacos, and the British put them on tea sandwiches. Here in America, we tend to chop them up into picnic salads with eggs and mayonnaise. Tiny tomatoes are the perfect fresh-off-the-vine food to snack on. Little hands can harvest ripened tomatoes planted from seedling in less than two months. Look for varieties like the Super Sweet 100, Sun Sugar, Black Cherry, and Husky Cherry Red for extra sweet flavor. If your child isn’t crazy about eating a raw tomato, you can turn them into tomato salsa, pasta sauce, soup, or bruschetta topping. 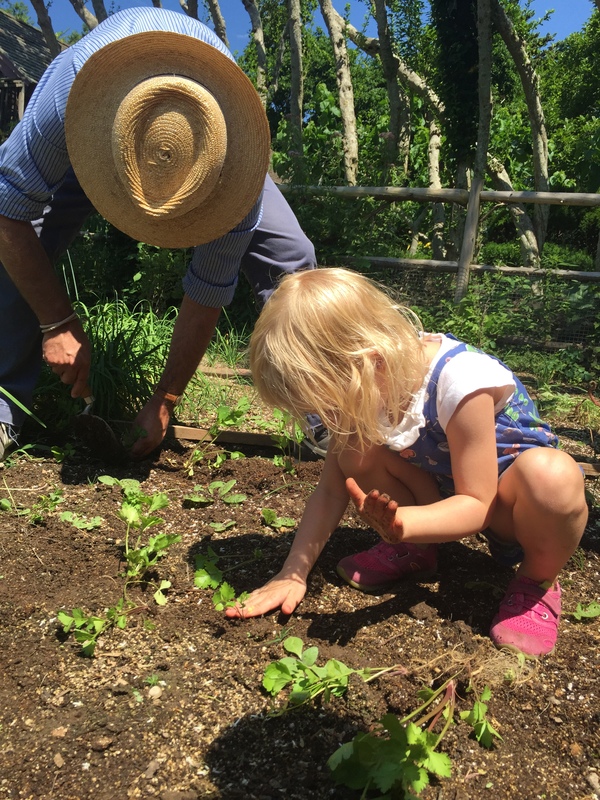 Shine’s “Garden Project” class, geared toward ages 3-5 or 5-7, is another ideal way to spark your child’s interest in gardening. Our projects combine art, science, and nature in highly engaging ways to foster lifelong learning, creativity, and Earth stewardship. Contact us for more details.